Winter arrived finally, as did the snow! We wake after a night of snow to a winter wonderland on the beautiful alps of Switzerland. the town of Siebnen, Switzerland, Europe. Yesterday we drove from Freising, Germany to the tiny community of Siebnen in Switzerland. We will be staying with a friend there and the plan was to explore some of the local sights. However, the weather didn't co-operate during our stay .... at all!! It was grey and wet the whole time - except for a brief clearing this morning. Today we decided to head into Zurich. Along with our friend, we decided to head up the mountain behind Siebnen then onto Zurich from the other side. The drive was fabulous with icy water trickly down the side of the rock faces and into pristine rivers, all surrounded by beautiful forests. At the higher altitudes, the landscape was covered in soft, fluffy, and fresh snow. 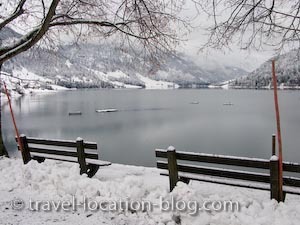 We soon arrived in the town of Innerthal which is situated on the shores of the Waegitaler See (lake) which is a reservoir. The scenery was just beautiful especially with the fresh snow. The plan from here was to drive directly to Zurich without returning to Siebnen which meant driving over a pass. Unfortunately, the small vehicle we were in was no match for the fresh snow which was thickly coating the road. Rolf and I got a good workout pushing the car .... uphill. Eventually, we decided it was probably not a good idea to continue, so gave the car one final push to turn around and headed back towards Siebnen and then onto Zurich. Just as we returned and found our way out to the autobahn, the rain came .. and really heavy!